Aerospace components are among the most challenging parts for metal manufacturers to produce. Any given project demands expert engineering, high precision, and a vast stock of parts, all of which must be carefully crafted to meet stringent industry guidelines. 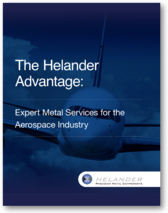 An in depth look at the different services and techniques Helander offers for the aerospace industry. Specialty materials our team of experts use. How Helander has helped others within the industry with successful projects. Fill out the form on the right to access a download link to our eBook.